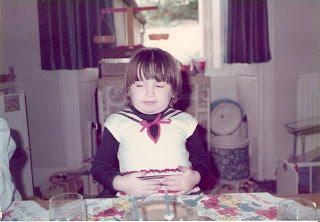 The below photo is of me at 4 years old having apparently eaten my entire birthday cake myself! This is exactly how I was feeling at the end of a 5 course pre-Christmas dinner I made this week for my family as my sister, Lucy, and her boyfriend, Jamie, were here for just 1 night en-route to the UK. The mammoth dinner is also my excuse for my lack of postings this week...not much of an excuse I agree, but I'm sticking to it. I have cooked for large groups of people in the past, but I've always kept it simple. Christmas dinner has to be special though and I wanted to make it something to really remember. As a result it ended up requiring a huge amount of planning, preparation and exhaustion! I had an hour by hour chart up on the fridge of what I needed to do to make sure everything would be ready on time and I got started at 7:30 on the morning of the big day. Prior to that, the shopping alone had taken 2 days since I couldn't get everything I wanted in the one supermarket. I also thought it would be really nice for everyone to have a memento to take home with them so I had typed up the menu and made red menu cards - with a childhood photo of each person stuck on in the place of name cards. Sourcing all the photos had started a good 6 weeks ago and it was well worth it since it gave everyone a great laugh. Last year I had done a Christmas dinner in November (a more simple one) during a fleeting visit from Lucy and as a result had to use a frozen turkey since fresh ones weren't available. This year I automatically planned to buy a frozen turkey and it wasn't until the day after the dinner that it struck me that I could have bought a fresh one. Just for the record: frozen turkeys are an absolute pain in the derriere! Last year's 5kg turkey had defrosted quite quickly and easily but this year's 8kg bird seemed to take forever and I practically got frostbite trying to get the bags of innards out from inside it - with a frozen turkey they bag up the offal and it's stored inside the turkey since some people like to eat it...that does not include me and those tricky bags went straight in the bin. With the dinner planned for Wednesday night, my trusty sous-chef (my husband Simon) had to work which left me to prepare everything myself. For our starter I had planned a plate of small bites: a melba toast with smoked salmon (smoked salmon's a tradition in Jamie's family); a skewer of prawn & pineapple (prawn cocktail is Simon's family tradition so this was a twist on that) and finally a skewer of mozarella & tomato with basil out of my balcony garden. I bought fresh prawns on the morning of the dinner and cooked them in sweet chilli sauce since I'm not happy to eat cold, previously frozen, pre-cooked prawns as I'm pregnant (news flash for those not aware of that fact!) They were all easy to assemble - and they did taste delicious - but of course they required a fair bit of advance work. I also made a tomato soup (using my Granny's recipe) for the second course; again, buying tinned soup would have made my day a lot easier but I had set my bar high and wanted everything to be as fresh and homemade as possible. I only have myself to blame for all the work! I served this in a small mug so everyone wouldn't get too full before the main event and it was just the perfect size. Now for the main course. Having a standard small oven, I had bought a combination microwave a few months ago so I could use that as an oven when necessary. The problem with a microwave oven that's used as a convection oven is that once you have pre-heated it and set the timer, you can't then increase the time (or not as far as I'm aware anyway). The roasted beetroot and honeyed parsnips & carrots were in the microwave-convection oven, which inconveniently turned itself off about 10 minutes before everything else was quite ready. No problem...I just pressed for the convection to start again and the 'pre-heating' sign flashed up. Ten minutes later, with a slight acrid smell in the air I opened the microwave door to find that my gorgeous beetroot was blackened to a crisp! I was so annoyed I could have screamed but didn't want to ruin the evening so I had to bite my lip, stamp my feet and carry on. Luckily I had a back-up of peas and sweetcorn just in case - clearly, I know myself well. The beetroot was thankfully the only casualty of the evening and the turkey turned out perfectly; I cooked it for 5 hours but it could have probably done with only 4.5 hours - that is actually what my Mum had recommended to me but in my infinite wisdom I didn't want to risk it not being cooked enough rather than listen to the woman who has been cooking turkeys for 30 years! The honeyed parsnips & carrots survived the microwave, the sprouts with chestnuts were very well-received (so many people don't really like sprouts but these were tiny baby ones and were very sweet), the pigs in blankets had been made with real sausages (not cocktail ones) and everyone agreed mine were far more tasty and whilst I think some people were a bit dubious about the wild rice, cranberry and sausage meat stuffing (I didn't stuff the turkey, just cooked the stuffing separately), it was declared really delicious - thank you, Choithram's Good Taste magazine. The only big mistake was that I completely forgot to take a photo! I must have been so wrapped up in getting tucked into my plateful that it slipped my mind. At least I remembered in time to photograph the turkey before it was totally carved up. Dessert was Nigella Lawson mincemeat puffs with a choice of vanilla ice-cream, custard (tinned, I wasn't going so far as to make that from scratch) or home-made passion-fruit sorbet (Jamie Oliver recipe). There was also a fruit salad but I forgot about that until well after we'd finished eating and I saw it tucked away in the back of the fridge! The mincemeat puffs were not quite what they should have been since I used more puff pastry than the recipe called for (I could only buy 500g packs, not 375g ones) and I didn't have a square cutter so had guessed at the size of each puff which means they turned out about twice the size they should have been with half the amount of mincemeat they should have had. Still, everyone ate their large square of puff pastry with a hint of mincemeat spices and they weren't too bad! I have to say, though, that my puff pastry ones were a lot lighter than the Mr. Kipling shortcrust pastry ones I served up to my friends on Friday - his also had too much pastry and not enough filling which was very disappointing. Finally, with coffee and tea, I served my homemade chocolate dates and After Eights to anyone who could fit anything else in. A fantastic evening with my wonderful family (only my older sister and her family were missing) but I think next year I'll leave it to Mum who always seems to pull it off in a far more relaxed way - I suppose that's what 30 years of practice does for you. Roll on her dinner on Saturday...yum yum yum.